As discussed yesterday, the Reds were among the best run-prevention teams in the major leagues in 1919. While the team featured elite fielding, a healthy chunk of that credit goes to their pitching staff. The Reds' rotation shouldered the majority of the pitching load, accounting for 84% of the innings pitched by the team. Dolf Luque accounted for most of what was left, which included a handful of starts and a good number of performances in relief. 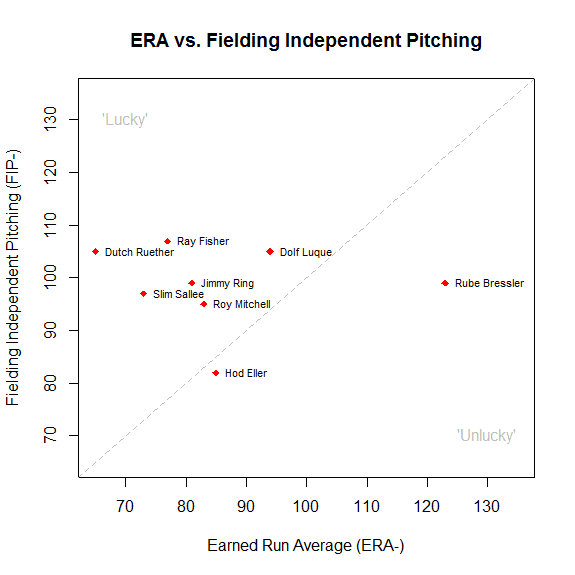 I put "Lucky" and "Unlucky" in quotes there: even in modern day baseball, you can't chalk all of the gap between FIP and ERA to luck. And in the dead-ball era, I suspect that pitchers had more control over things like BABIP than they do presently. Nevertheless, Hod Eller seems to clearly have been the ace of this staff. He threw the most innings, posted a good ERA, and had the best fielding-independent numbers to go with it. Now, a look at some of the underlying numbers to reveal how these pitchers went about their business. 24-year old Hod Eller posted what was easily the best strikeout rate on the team. It was his third year in the big leagues, all with the Reds, and he was a Shine Ball specialist. This was a pitch created by rubbing one surface of the baseball extremely smooth using a patch of paraffin wax. This, when coupled with a roughed-up ball courtesy of his infielders, resulted in a ball that could break in a variety of directions depending on which surface was up. The pitch became very controversial by the 1919 season, was banned prior the 1920 season. He missed much of May and June as he worked to develop an alternative arsenal. While he ultimately pitched pretty well over the rest of the year, he reported out of shape in 1921, lost his starting job, and ultimately was out of major league baseball. So, with the pitch, more or less, went Hod Eller's career. But in 1919, it was a heck of a weapon. It was Eller who pitched game 8 that ultimately brought Cincinnati its first World Series title. Slim Sallee is interesting. The veteran southpaw seemed the extreme version of the pitch-to-contact pitcher; almost every batter he faced ended the appearance with a ball in play. He was known for having other-worldly command, and it showed in his walk rate. But he also didn't strike anyone out in 1919. By this point, Sallee had been playing for 11 seasons, for the Cardinals and then the Giants, and was in his first and only full season with the Reds (a deal he apparently engineered by refusing to play for anyone else!). He'd been dealing with back problems since the prior season, and re-injured his back during spring training, which likely accounts for the major drop in his already-low strikeout rates from earlier in his career. Nevertheless, using a combination of command, knowledge of batters, and guile, he still managed a very effective season. 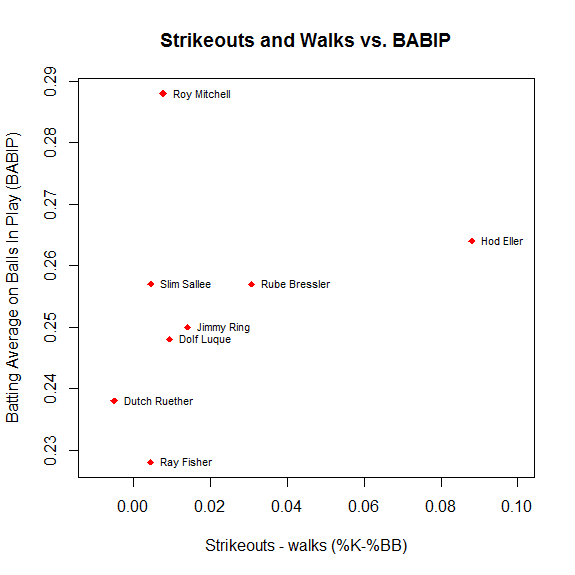 With the caveats mentioned above about the meaning of BABIP for dead ball pitchers still in mind, here is a comparison that tries to get at fielding-independent numbers (K-BB%) versus results of balls in play (BABIP). 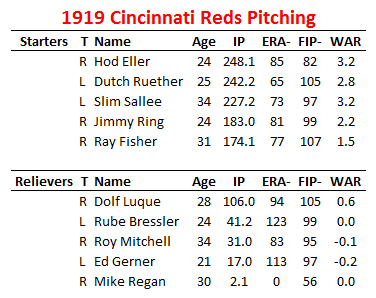 Here is where two of the other Reds' starters show up as interesting: Dutch Ruether and Ray Fisher. 1919 was a breakout season for Ruether. He posted a 1.81 ERA in 240+ innings as a 25-year old, and would go on to pitch as a dependable starter for the Robins, Senators, and even, in his final year, the 1927 New York Yankees. Throughout his career, he posted a K-BB rate of nearly 0, but as his BABIP swung up in the live ball era, so too did his ERA. Fisher, on the other hand, was 31 and on the downside of his career, having just returned to baseball after being drafted into the army during the 1918 season. He was a spitball specialist, but unlike Hod Eller, he was among the 17 pitchers exempted from the ban on doctored baseballs that began in 1920. Nevertheless, 1920 was his final year. He went on to coach for 38 years at the University of Michigan. The only starter who didn't pop out as remarkable on these graphs was the dependable Jimmy Ring. 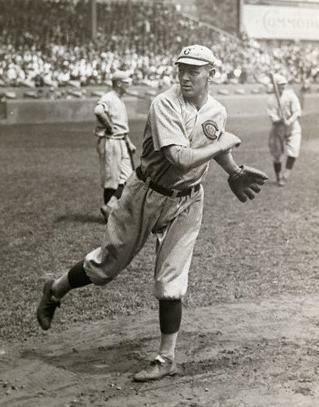 Like Dutch Ruether, Ring had something of a breakout with the 1919 Reds. He'd actually joined the Reds rotation as a 23-year old the year prior, but took a step forward in 1919, posting better strikeout numbers and the best ERA of his career. The Reds ultimately traded him after the 1920 season to Philadelphia in exchange for Eppa Rixey, and Ring went on to post five solid seasons for the Phillies. When the starters could not finish a ballgame, the man who usually got the nod was reliever Dolf Luque. 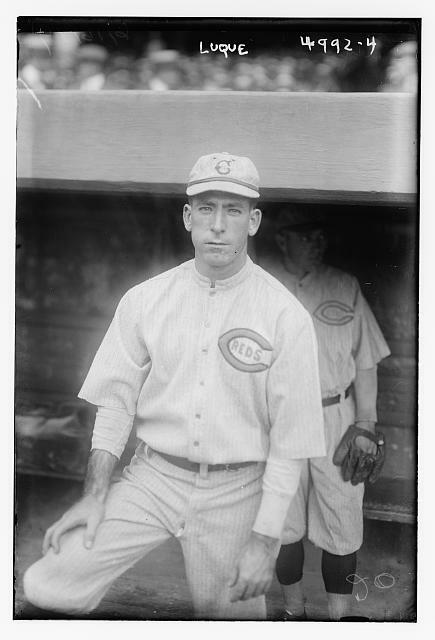 Loque, who hailed from Cuba, was in his second season with the Reds, and in 1919 pitched primarily in a relief role, with 9 spot starts among his 30 appearances. On May 16, 1919, Luque threw the first shut-out of any latino ballplayer. He would go on to secure a full-time starting job in 1920, and would be a keystone starter for the Reds through the 1929 season, earning a place in the Cincinnati Reds Hall of Fame. One other reliever was of particular interest: Rube Bressler, also a Reds Hall of Famer. 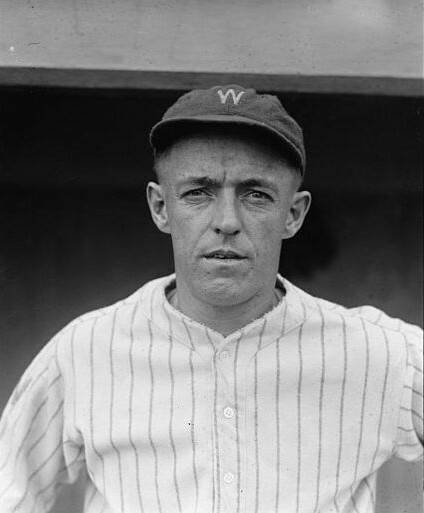 Bressler had debuted in 1919 as a left-handed pitcher for the Philadelphia Athletics, and had had a fine debut season. Unfortunately, by 1919, he'd encountered arm troubles severe enough that he'd been relegated to the bullpen. One day, when outfielder Sherry Magee was ill, Reds manager Pat Moran tried Bressler in the outfield. That was the start of his career as a hitter. He didn't succeed immediately, but by 1921 Bressler started to have success. He'd go on to have a number of above-average seasons with the Reds as a high-contact, high-walk, on-base oriented hitter. Up next: the 1919 Reds Position Players! A brief note on methods. These data are all from FanGraphs, but for WAR I am using an average between FIP-based WAR (FanGraphs' default) and Base Runs-based rWAR (Baseball-Reference's default). This roots WAR somewhere in between the ERA-based measures of value that many are used to, and the Fielding-independent numbers I tend to prefer. This is particularly important for dead ball era pitchers, but it is an approach I'll take throughout this series.